I made a cape for Aunt March over the weekend. I did not have the color of lace I wanted so I took two mint green laces I had and dyed them the color you see in the pictures. I forgot to take pictures of the lace before I dyed it wish I had so you could see the color change. One of the laces is 100% cotton the other a cotton/poly blend so yes you guessed it they did not dye exactly the same color. But I expected that. 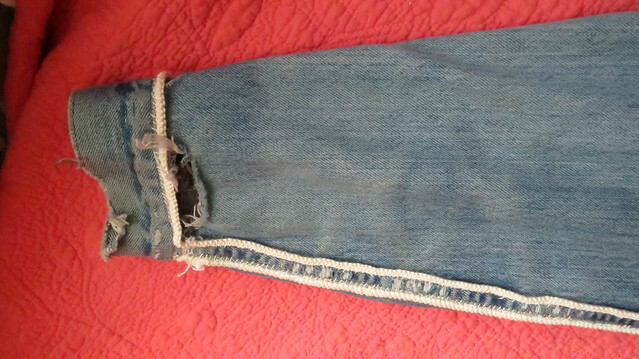 I used them on alternating rows on the bottom hem. To give a little contrast to the cape. 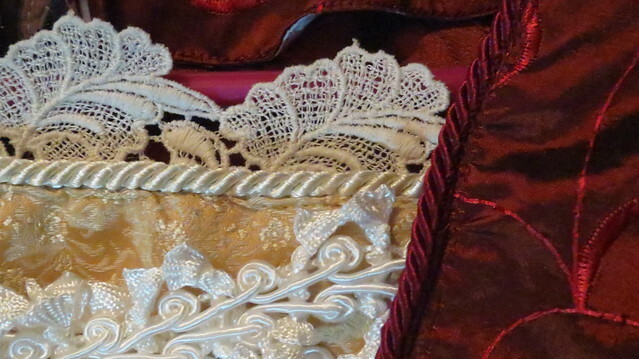 I also used soutache braid on the cape hem on three rows of the lace the braid I used was about 100 years old. The lace one is antique and one is vintage I bought both spools of lace at the same time at an antique store about 2 years ago. They where the last of a supplies of new old store stock the antique store had. Both where made by the same manufacturer but because one was older than the other the labels where a little different ie. 100% cotton as opposed to poly cotton and the age and design of the labels also showed a difference in age too. 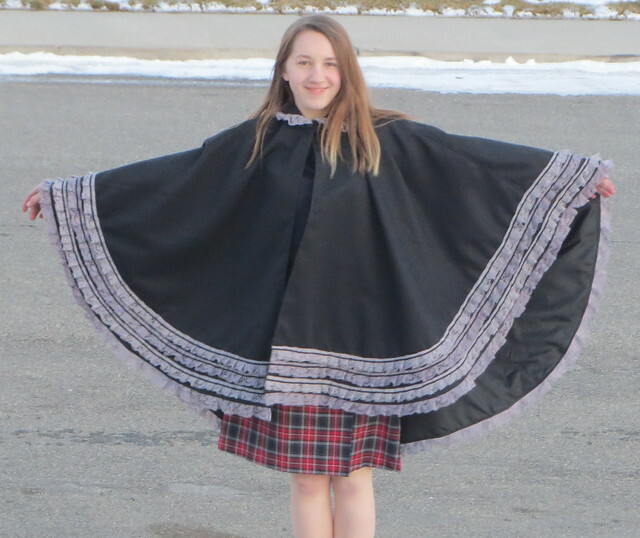 The cape is fully lined and has a hook and eye closure at the neck. 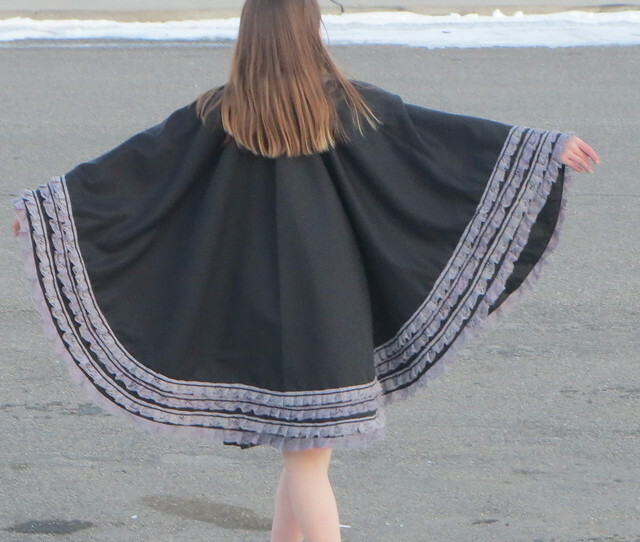 The cape is actually the same length on both sleeves but my daughter was having fun spinning circle right before I took the photo which made the cape hang funny on her. 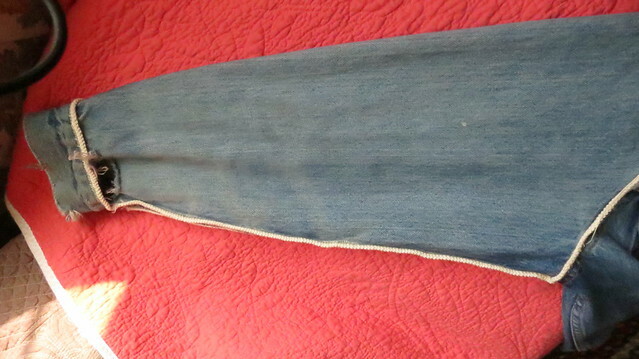 I am supposed to make 2 capes for aunt march this one is light in weight so it is supposed to be the fall spring cape . 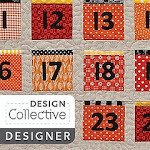 The other will be a quilted fabric so more of a winter cape. 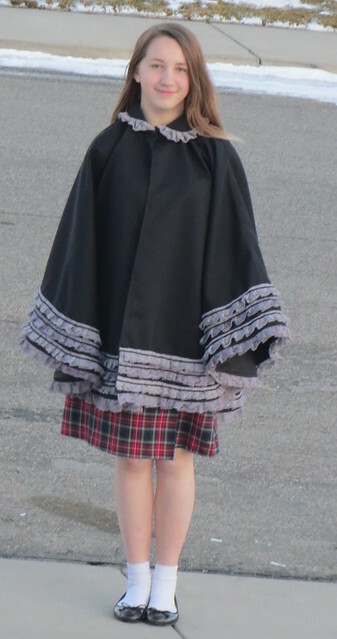 The fabric on this cape actually is the same fabric I used on Aunt Marches hat. So it has a pattern of little squares on the fabric which is hard to see in the photos as the cape is so far away from the camera. Look at this picture to see what the black fabric looks like up close. Right now this is Aunt March's came but I may switch it to Mrs. March's have not decided fully yet. So in the play Aunt March hands the family money some in the form of cash and some in the form of a check. The check she keeps in her purse the cash she keeps in a secret pocket on her petticoat. 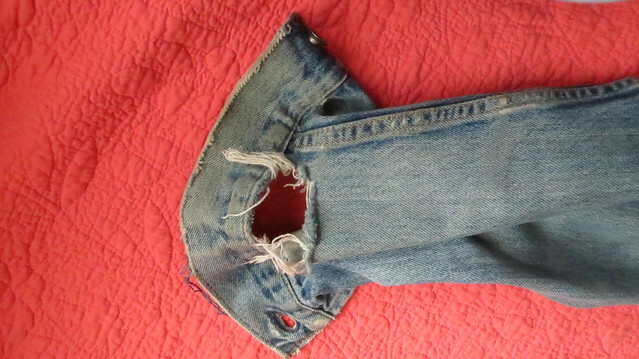 So that means on stage the skirt has to be hiked to reveal the pocket as she hands her family the hidden money. I sewed a French wire ribbon rose to the pocket in the hopes that will make it easier to find the pocket while on stage fumbling with skirt, cane, wrist bag and pocket. 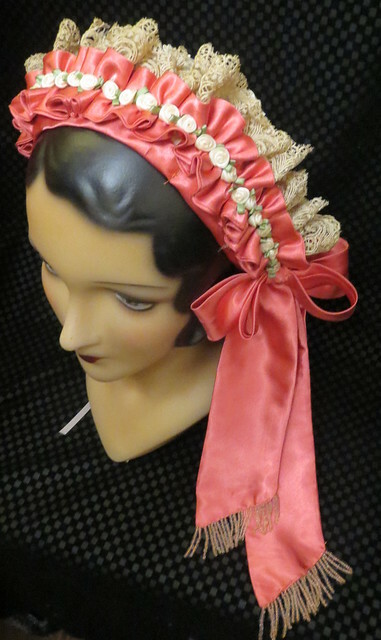 Two entire bolts of double sided satin ribbon were used for this. That may not seem like much if you buy your ribbon at craft stores but this was ribbon that my grandmother gave me from her flower shop. Each of those bolts have between 30 and 50 yards of ribbon on them. So that is saying a lot to use that much. Since Aunt March is supposed to be a little over the top. 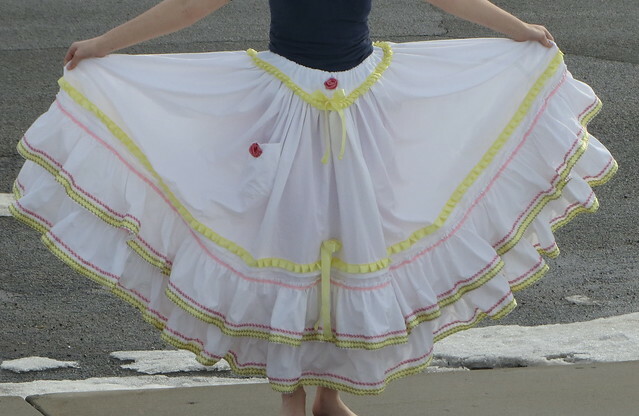 This is the petticoat that is a little over the top the others will be more simplistic as fitting their characters. This took me two days to make. 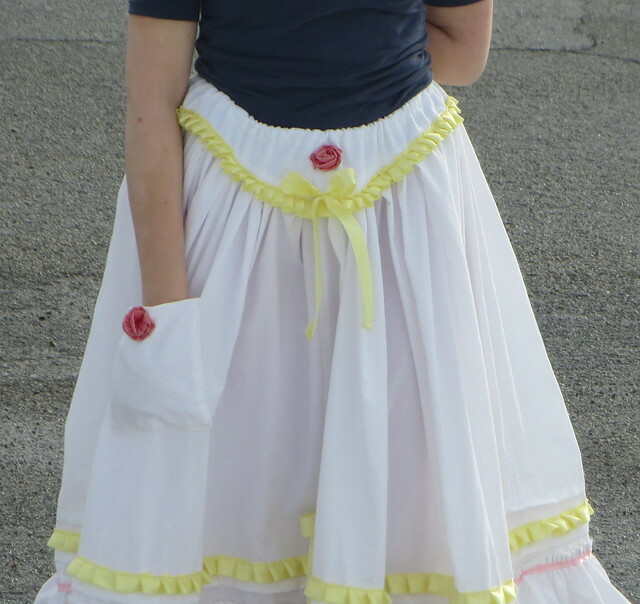 My daughter who is modeling for me is wearing pink pants under the petticoat. 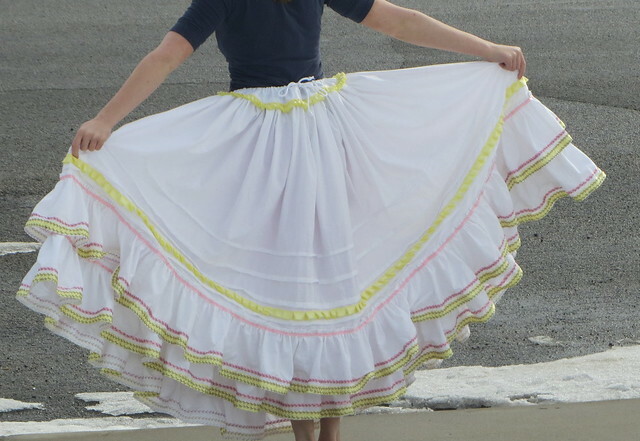 But during the play there will be white pantaloons on the her and it wouldn’t look so odd. When she holds out the dress like this to show how full it is. 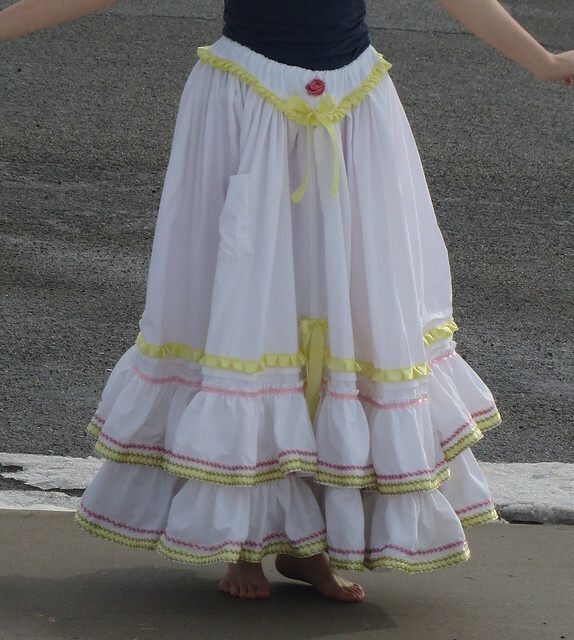 Reminds me of the dresses I saw in Mexico when we went on trip a while back. Here is a second hat I made today for my daughter to wear in the play. This hat has lace on it that is over 100 years old. The beads are also over 100 years old that I used to make the fringe on the tie. 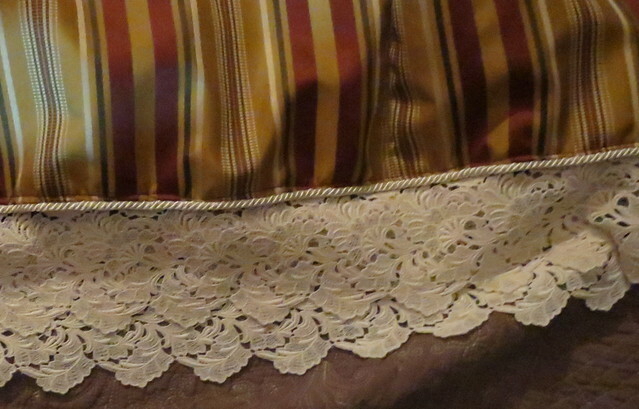 A friend gave me an old damaged lace curtain about 7 years back for me to use in my projects. The net is damaged through out the entire piece. So this seamed like the perfect project for it. 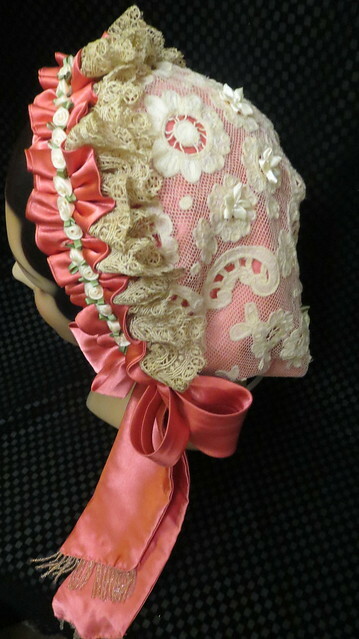 The right era of lace and adds so much to the hat. Also it will be used again now instead of just hanging on a hanger on the back of my sewing room door. 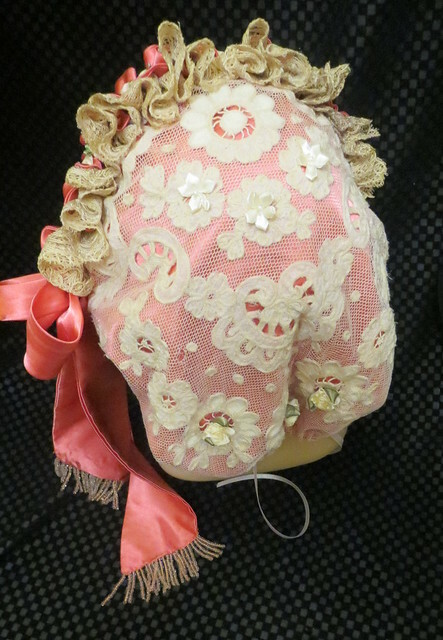 I still have scraps left from it so I might be able to use it again in the play for other headpieces. 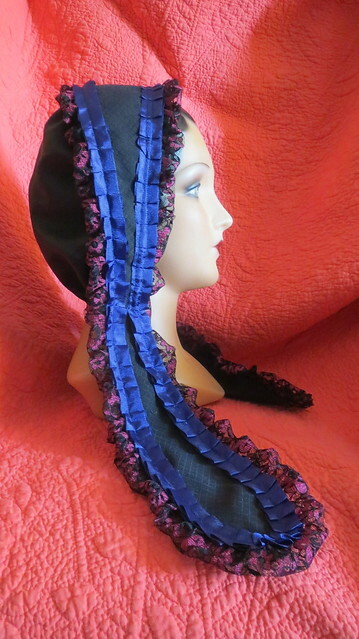 I sewed lots of ribbon roses on the top of the hat and I also sewed six flowers on to the back of the hat to give it some three dimensional aspects. I added some flowers to Aunt March's hat. I like it a lot better know. I think it adds just enough to put the hat over the top which is where I wanted it. 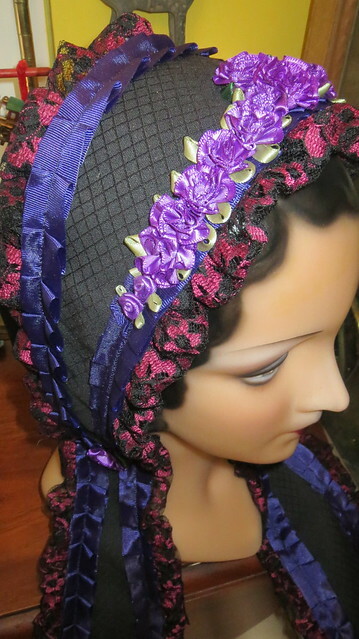 I added three flowers to the back of the hat and 2 to the two flaps that come down. I also added a lot of flowers to the top of the hat. 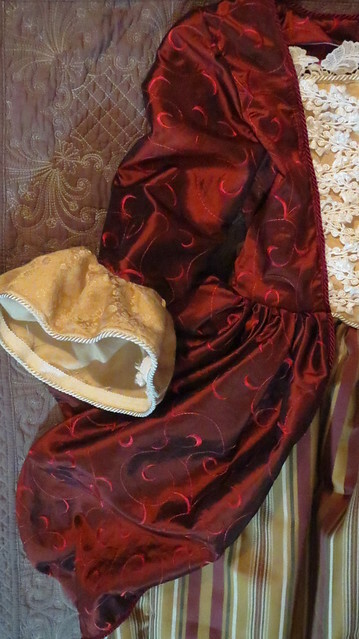 Here is the start of a costume for my oldest daughter to wear as Aunt March in the play "Little Woman". The production is not till May but for once I can get ahead start and good becasue the costumes are crazy difficult to make. This dress alone has over 154 cut pieces of fabric that have to be sewn together into a dress. I have lost count after that point but add about 20 to 30 more and that is this dress. I have never made a dress before that has that many pieces ( not counting individual beads and things of course) and still cutting out pieces this is insane. 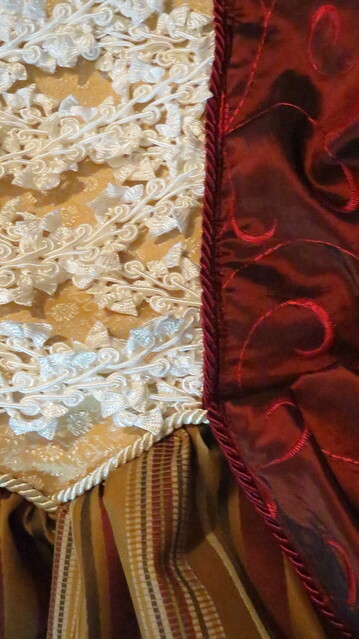 Oh and I forgot to say it has over 35 yards of fabric in it how did woman wear such dresses 100+ years ago. Seriously if this dress was on a little old lady she would not be able to move or it might kill her from the shear weight of the item. 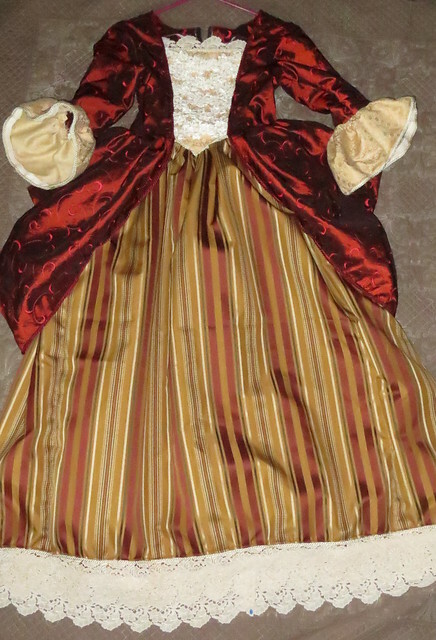 That yardage does not even count, stockings, pantaloons, corset, hoop skirt slip, shawl, hat, gloves, scarf, purse and all the other stuff that has to go on her still. I am wondering if my daughter will be able to move seriously. She may wipe out a few other actors in the hall back stage with this. It is just one of two crazy dresses I have to make for her for the play I have yet to start the second or the ones for the other actors yet. 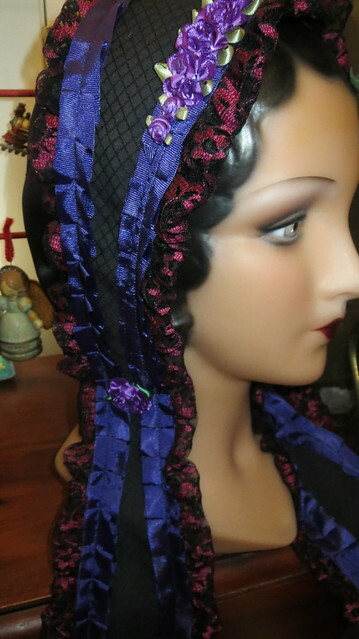 Below is the hat i made to go with this dress. 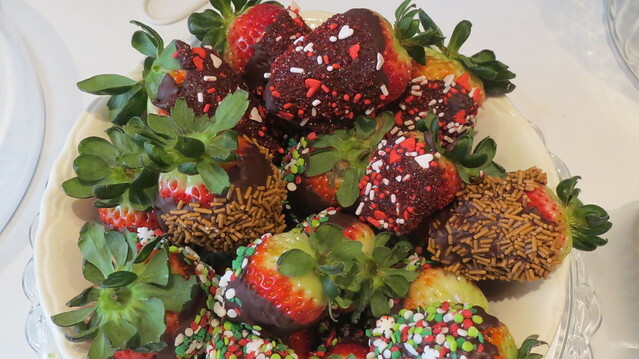 My middle daughter wanted to make chocolate strawberries today. We had just bought fresh strawberries yesterday for cereal so much for that thought. Now we have 50 + treats in the fridge. Here is where the recipe came from if you want to make some too. 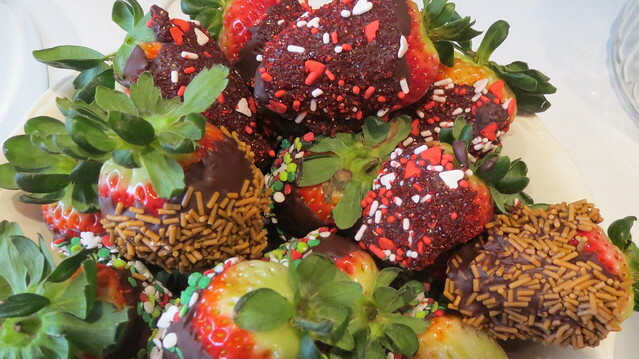 Good for valentines or mother's day or any day you have fresh strawberries. The tan colored sprinkles are caramel flavor. That jacket that I have been reworking for a while. ( posts : one, two and three ). So now I am at again. The sleeves are getting a little too thready. First I lined all the areas I want to knit in with Romanian cord just so I have something to attach the knitted piece too.I have four panels of the jacket I want to rework but I am starting with one of two smaller sections first. I am knitting with size 0000 double pointed knitting needle and size 10 crochet knit thread. 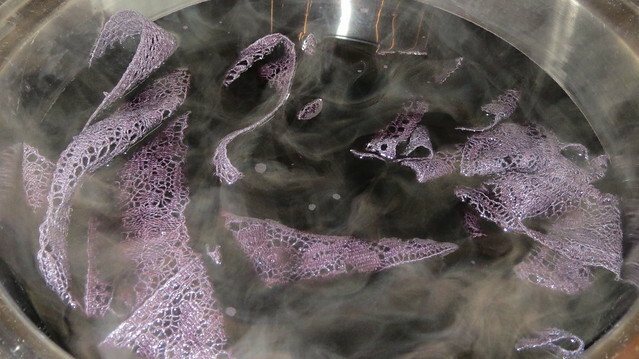 Some of the thread is way old and boil-fast some is new and mercerized. 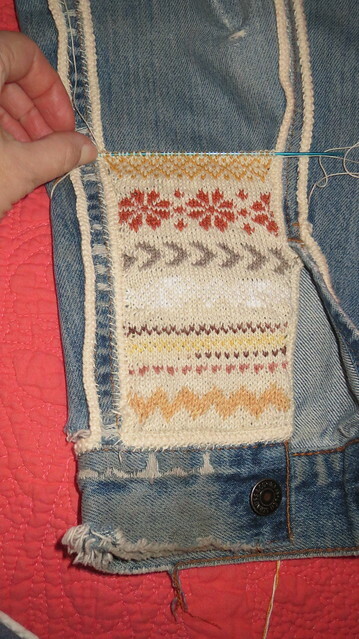 I am just playing with different fair isle patterns with this but using the same color through out for the background color. I am not changing colors within a pattern as I think that will get to busy after a while, but some of the threads are variegated so they do a little changing on their own. I am also not trying to add a lot of color just sort of staying in the earth tones. I have not made much progress on this yet but I thought you would like to see the starting point of it all. But as you can see that one hole right next to the cuff is gone with just this much knitting. I am planning on leaving the Levi material behind the material for added strength to the knitting and for more warmth as well. 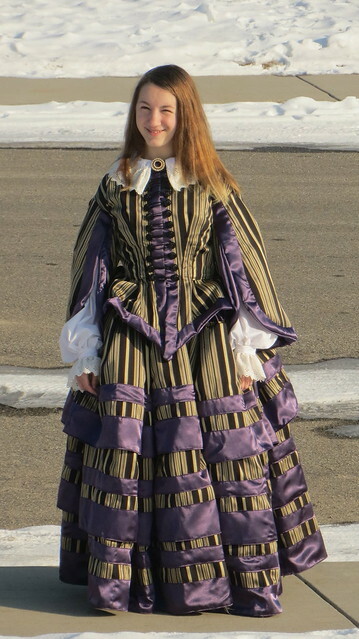 Encase you were curious this is how the dress looked on my daughter. I went back and did some bead work on the dress before she wore it to school. I finished the dress Saturday. But Sunday when I looked at it well it was just too plain for me. So I added 3 yellow seed beads at the end of every leaf on the front and back bodice and sleeves. Then I beaded all the vines on the front bodice with red seed beads. I like it much more now. Click on the image to the right to get a better idea and see the details of the beads. My grandmother had this witch in her house that we called Befana when I was a child ( we actually had a few of them). She was the Italian witch ( more like a midwife I would say) In Italy the children wait until Epiphany, January 6, for their presents. According to tradition, the presents are delivered by a kind ugly witch ie. Befana on a broomstick. It was said that she was told by the three kings that the baby Jesus was born, she was busy and delayed visiting the baby Thus missing going with them. She then missed the star and lost her way and has been flying around ever since, leaving presents at every house with children encase he is there. She slides down chimneys, and fills stockings and shoes with good things for good children and it is said leaves coal for children who are not so good. Friday night my family went to go and see the "Scarlet Pimpernel" the musical play version it ended real late, during the course of the play my youngest tells me she needs a costume for Monday at school. So that means Friday is shot as no time to look up anything to even get an inkling of an idea for a costume. 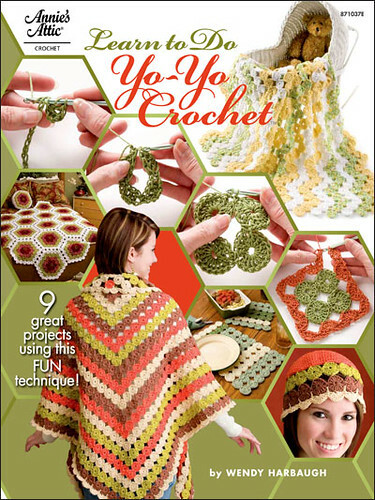 Saturday morning comes around and we get out my pattern books. She flips through my two books and post-it notes the ones she likes. I have two file cabinets full of patterns one book per cabinet which covers four draws each drawer holding about fifty patterns. I agree with one of the patterns she has tabbed, the only one that I think I could make fit her. She is sort of between sizes at the moment a size ten at the chest an eight at the waist and a twelve at the hips. So if a pattern is strictly for children it will not fit her or strictly adult it will not fit, this one crossed the barriers between the two. So it was time for a learning experience for my oldest daughter. She usually traces my patterns for me sort of payment for mom making costumes is every now and again I have them help me with them. So I explained how the pattern pieces had to be modified when she traced out the pieces (I do not cut my patterns). So I set her to work on tracing all the pieces needed. She did the mods from just my explanation. The true test would be when the dress would be tried on the youngest daughter to see if it fit. My oldest did a great job at following instructions it fits perfectly. I was lucky in that not one item in this costume did I have to go to the store for. I thought I would have to go get a zipper but I found I had two on hand so I was happy not to have to go to the store at 10:30 pm on Saturday to get a zipper. 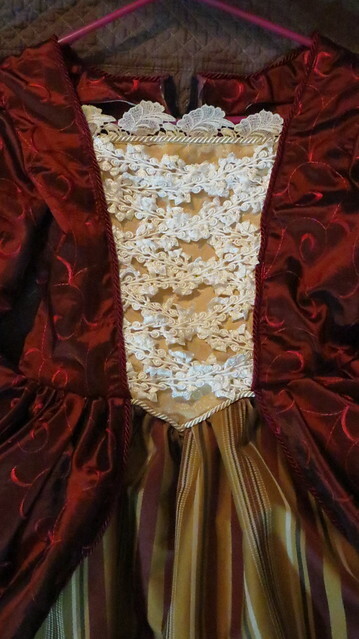 In these photos I still have yet to sew on the hook and eye closure, the hand beadwork on the bodice/sleeves and I still needed to hand sew one lace to lace seam on the hem. 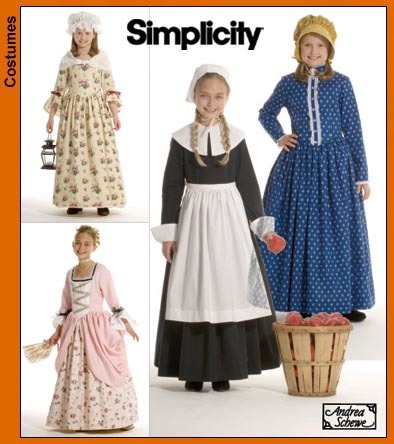 I may still make a mop hat and a bum roll for her to wear but I am leaning towards a crinoline for her to wear. 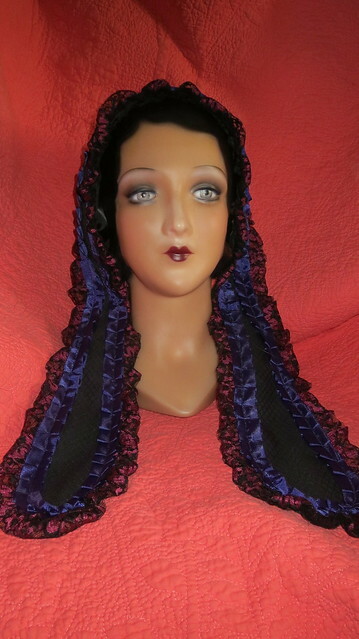 She will be wearing the snow queen shawl that I made a few years back. 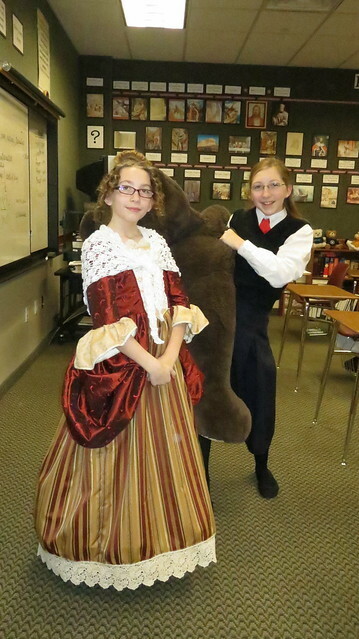 This is for a school class celebration where they will be discussing and doing colonial games. 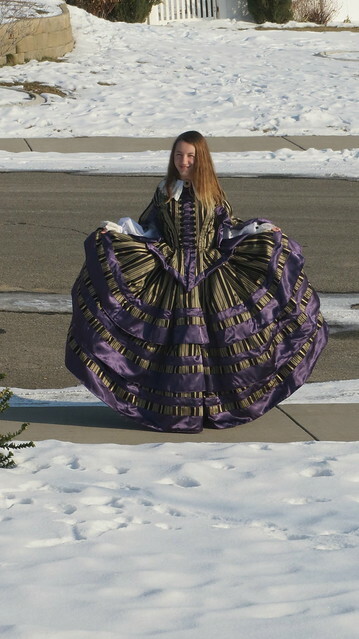 This daughter is in a play this year that has a colonial scene in it but I am not sure she is in that scene, I think she is going to be in Queen Isabella court scene so we probably can not use this costume for that may be the only time it is worn. Actually all my daughters are in plays this years. Some already did "The Sound of Music", the oldest two. The oldest is in "Little Woman" as Aunt March, the Middle is in "Aladdin" and the youngest is in "The Patriot Program". The pattern I used was simplicity 3725 encase someone else wants to use it too. 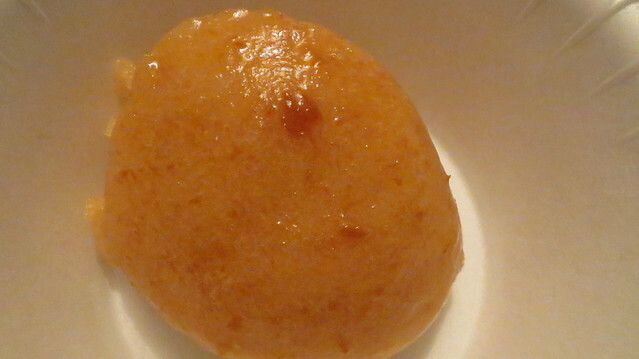 I used the basic fruit sorbet recipe to make an apricot sorbet just used the same amount of apricot as I did for the blueberries and strawberries combined and about 1/4 cup lemon to keep it from browning as it chilled. The fruit I was given at the end of the season last year and we had been using them for smoothies but thought this would be a little different and give the girls a little bit of an easy treat in the freezer instead of having to stop and make a smoothie they just have to get a scoop out of the freezer so much easier for them. Made the first batch on New Years morning. Have enough prepared to make 2 more batches. Then I can probably make about 3 more batches with the fruit I still have in the freezer then I want to go on and make pomegranate sorbet so much easier these days since you can buy that juice already in a bottle then when I was a kid growing up in Cali. Not so easy then had to go pick the fruit off of my Vova's tree cut open pick out all those little pieces of fruit and mash would take forever to get the juice to make jelly, or this type of thing. Now I can have a taste of home with out as much work. That is not to say I will make it all the time as the one disadvantage to it already being juiced over the tree is one cost 12 dollars a bottle and one is free (not counting labor here). But the 12 dollars is still probably cheaper than the labor. My children also want me to make some ice-creams in the near future so this little attachment is really going to get a work out too bad I do not have 2 or 3 of them I could get so much more made at one time.